A bowl of good old butterbeans – tra la! I think everyone has their favourite beans. What are yours? I never ate any of these dried wonders until I left home. They weren’t in my family’s food vocabulary. Like a lot of the foods I am interested in, they require work to transform them into something that you really want to eat. This is just delicious….and at the moment I could eat it every day…. 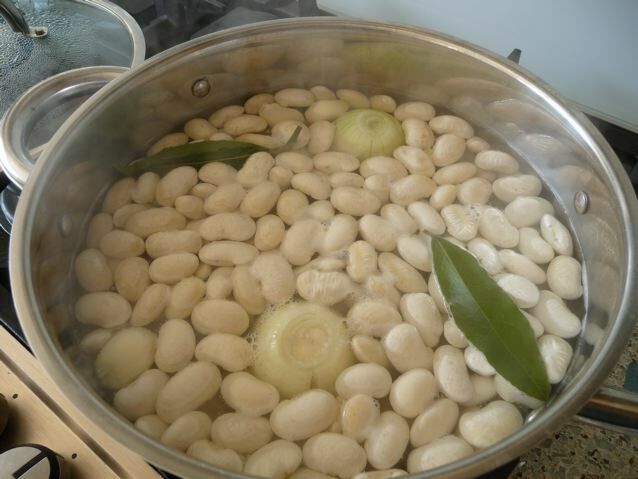 Soak 300 grams of butterbeans overnight in water with a teaspoon of bicarbonate of soda, this helps to stop the skins falling off and tenderise the skins. Make sure there is enough water to more than cover the beans as they swell up as they soak. The following day drain and rinse the beans. Place in a large pan with plenty of fresh water. Add an onion chopped in half and a couple of cloves of garlic and a bay leaf. Bring to the boil and boil at a rolling boil for about 10 minutes, then simmer uncovered for an hour and a half, or until the beans are tender. Do not add salt before this as it will harden the skins. Add salt to taste and simmer for another ten minutes. Drain and discard the onion and garlic and bay leaf. Zest a lemon, and squeeze the fruit. Add the zest and about half a lemon’s worth of juice, again to taste, finely chopped parsley, or coriander if that is your preference. Stir in a little freshly chopped garlic, salt and pepper, 2 tablespoons of extra virgin olive oil. Mix well and serve with other salads, as a vegetable side dish, on its own with a hunk of crusty homemade sourdough baguette! The original recipe for this in this month’s Waitrose magazine by the way which is a really good one and well worth getting hold of a copy. Their website doesn’t do the magazine justice. 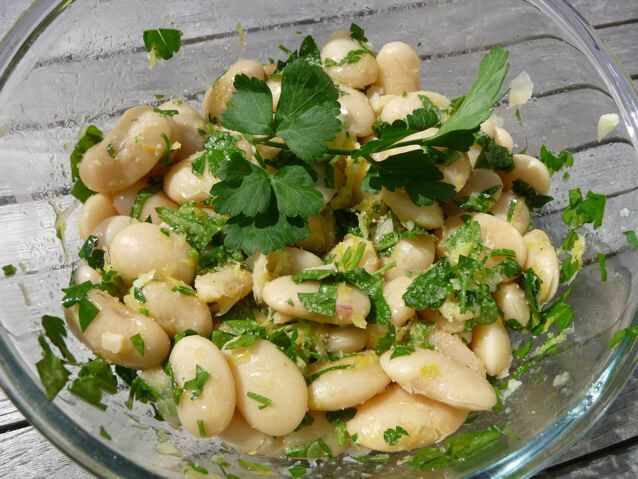 This entry was posted in Recipes, Vegetables and tagged butterbean, gremolata on 24/04/2010 by Joanna. Lovely! I think my favorite beans gotta be black, Brazilian style. Is there a recipe for Brazilian black beans on your blog Sally? I’d love to see it! Pulses and lentils, don’t you just adore them, Joanna. Butter beans are my favourite, although I don’t enjoy them puréed at all. I brought back bags of them from Spain when I was there, called granxet, which are small butterbeans, look like haricot, but taste creamy and buttery just as they should. Nice tip on the bicarb. I’ve not heard that before. & what is that nuns in a scrum object next to your toaster please? 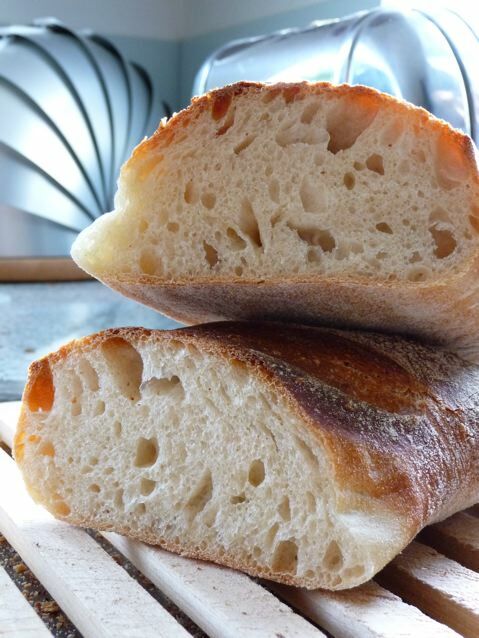 It’s my breadbin :) and I’m with you on the puree thing, Gill! Mjam, butterbeans, I love them. And I am just baking 5 baguettes! Looks delicious..I shall try that in the week. Don’t know whether I dare ask but have you ever made with canned beans ? Sorry if that upsets anyone but I love beans and pulses as a ‘quick’ ingredient to add to a medley of salads and for impulse starters etc so I am always scouring around for good recipes from the canned beans and pulses. Yes of course I use tinned pulses and if I was in a rush I would definitely use them. I think the dried ones are a bit nicer,but if you rinse the tinned ones well they are usually fine. I adore all legumes, but probably my all time favourite are chick peas. We’re trying to grow them fresh this year! Also love endamame (soya beans), but they only seem to come frozen from China, so we’re trying to grow those as well! I tried soya beans Celia, I made them in croquettas with a few other vegetables. I thought they were the best taste in there, quite distinctive. I think we can only get them frozen too. C and G, there is something different about soya beans and their cooking requirements from other pulses, which is why you have to be particularly careful, I have no idea whether this applies to the fresh young green immature ones that you get frozen or whether this long boiling time only is for the old dried ones though – it’s a bit confusing, isn’t it? ‘Soya beans: Contain an anti-trypsin factor (or trypsin inhibitor) which prevents the assimilation of the amino acid methionine. Soya beans also require careful cooking to ensure destruction of this factor. They should be soaked for at least 12 hours, drained and rinsed then covered with fresh water and brought to the boil. Soya beans should be boiled for the first hour of cooking. They can then be simmered for the remaining 2-3 hours that it takes to cook them…. Soya flour should state heat treated on its packaging. Other soya products (e.g. tofu, tempeh, soya milk, soya sauces and miso) are quite safe to use. Soya beans can be sprouted, but the sprouts should be quickly blanched in boiling water to inactivate the trypsin inhibitor. I’ll stick to frozen soya beans then. They mention tempeh too, I made a vegan dish last year and was blown away by tempeh – it’s delicious food!